It's time for the January edition of Links We Love! We've gathered links from all around the Internet pertaining to various facets of #smallhomefamilylife. Every January, people are ready to clear stuff out of their homes. I know I am! We've been getting a lot of hits this month on our Tiny House KonMari posts, especially with the release of Netflix's new series Tidying Up. So why are Americans especially so enthralled with KonMari (love it or hate it)? The L.A. Times takes a stab at answering this question in "America's love-hate relationship with Marie Kondo and our clutter." Does something about KonMari and the whole decluttering process not quite sit well with you? Perhaps you are unsettled by the sheer amount of trash generated by the decluttering process? In truth, we are as well. We tossed and donated a lot of items during our purge last spring, and I still don't feel great about everything that ended up going to the landfill in the end. Is there a better way? Over at Treehugger, Melissa Breyer shares about the Japanese concept of mottainai or using an item "all the way to the end of [its] lifespan." Mottainai basically echoes the old jingle to "Recycle, reduce, reuse!" only perhaps on a much deeper level. Do you think there's a balance to be found between minimalism (and decluttering) and not being wasteful? Can both ideas coexist? Evelyn over at Smallish recently shared five things to consider while downsizing your stuff, and we think she's on to something. If all of that wasn't motivation enough to cut back your stuff, this list of resources over at The Coupon Project might be what you need. Because who doesn't come away from watching an episode of Hoarders ready to set fire to half of their belongings? Are you on board with minimalism and decluttering, but your kids are, for lack of a better description, getting in your way? At least one of our kids really struggles with her relationship with stuff, so we feel your pain! For some practical tips on how to help your kids pursue a more minimal lifestyle, check out this recent article from Real Simple about raising kids to be minimalists. On the other hand, maybe just do like they do over at The Tiny Canal Cottage and find creative and beautiful ways to hide all the toys. Speaking of having fewer belongings, have you considered the idea that having fewer clothing items might actually make your life easier? I've certainly found this to be true in my own life. Want to take it even further? Perhaps take a page from Joshua Becker over at Forbes. He did an experiment where he wore the exact same thing for a week and made some interesting discoveries about appearance and judgment and the things about which people actually care (or rather don't care). Now that kind of wardrobe would really simplify getting dressed in the morning! Did you know that we keep most of our clothes in the bedroom closet? Aside from some of Chris's things, we all share the one big closet that just happens to be in what is now our daughters' bedroom. Alison of 600SQFT And a Baby recently wrote about their shared closet in the kids' room, and like her, I used to wonder if this might eventually be a problem, but I agree that it hasn't been. It's just one more example of doing what works when you live in a small space. Looking for more inspiration for living tiny with kids? Check out the McClaughlin family of seven who decided to downsize into a 380 square foot renovated RV. For them, it's all about spending more time together. We have to agree! That's it for this month. 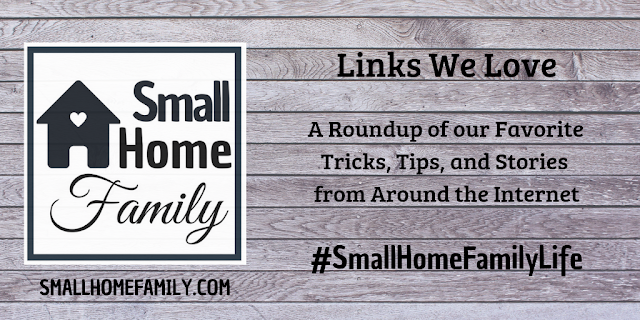 If you have any links that you would like to see featured on next month's edition of Links We Love, hit us up at Diane@smallhomefamily.com!